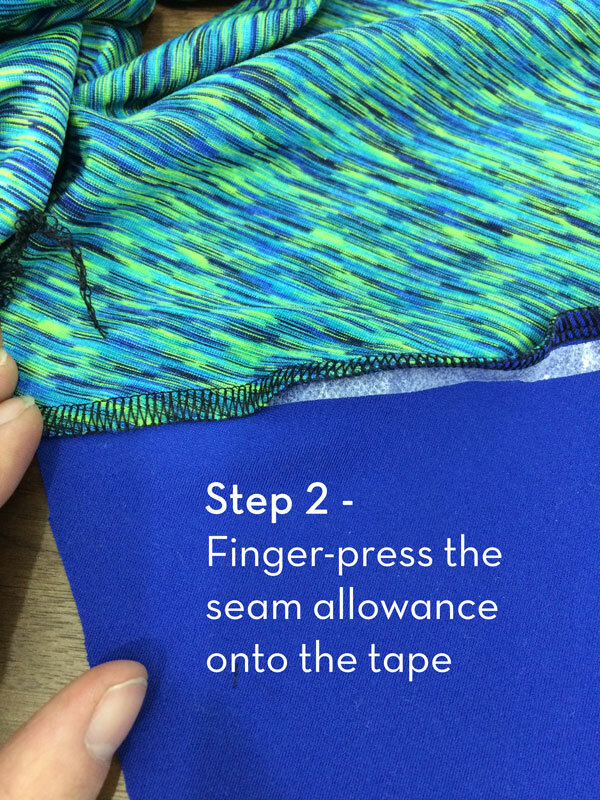 I'm sure some of you may know this tip already, but if you're someone who prefers to topstitch down all your seams for your activewear makes, get yourself a roll of Prym Wonder Tape, stat. 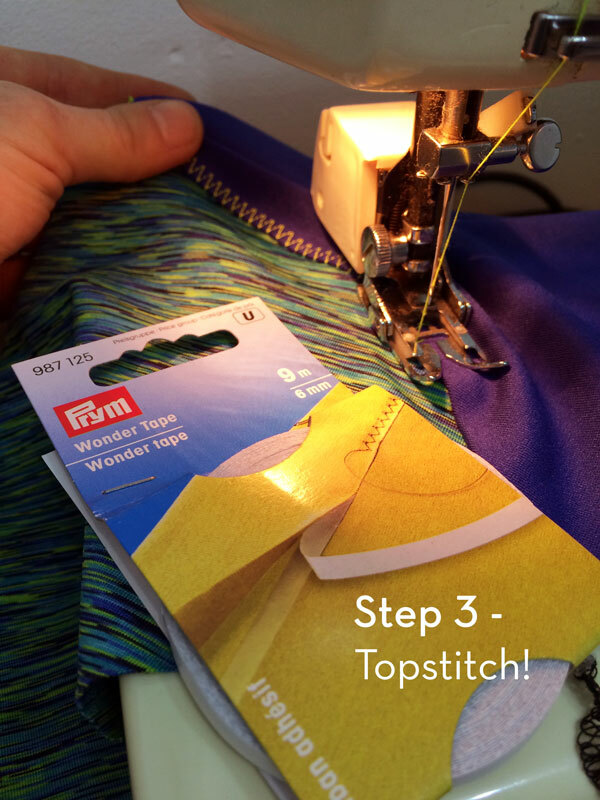 I've known about this stuff before, as I've seen other people use it for basting zippers in place, but I hadn't realised exactly how great it could be for topstitching until I decided to give it a try on a pair of Steeplechase Leggings I'm sewing for Cambridge Half next weekend. Wonder Tape is essential double-sided, sticky, washaway stabiliser, and it comes in a narrow 6mm (1/4in) tape roll. You stick one side, peel off the backing, stick something to the other, and that's it. No need to heat up the iron or anything and it comes out in the wash, leaving you with perfect topstitching. When I'd topstitched my seams before, I'd usually use pins (and always my trusty walking foot! ), but pins can make things lumpy and you've still got to constantly feel for the seam allowance underneath if you're stitching around curves (like on the Steeplechase's curved yoke yokes). This stuff just made it easy. 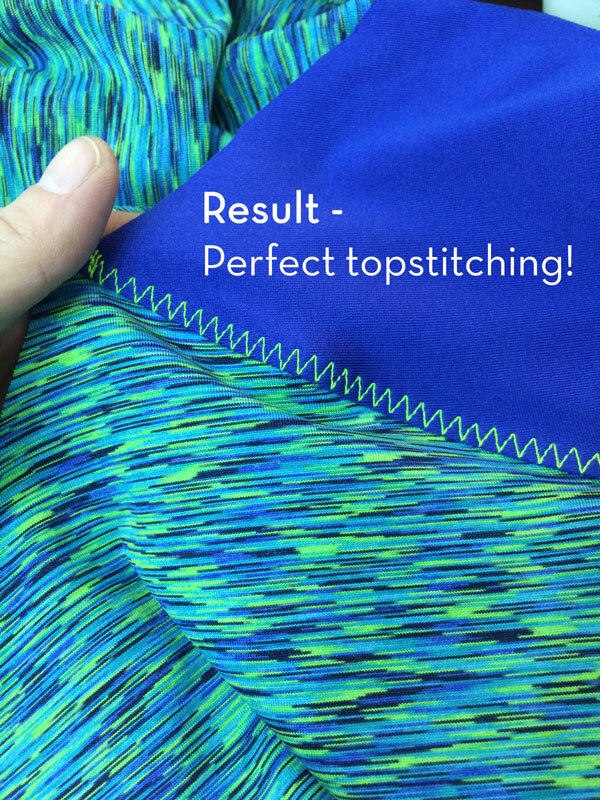 Result – Perfect topstitching that was way, way easier to achieve than using pins. Separator image Posted in In Progress, Inspiration and tagged with exercise, knits, shopping, tutorial. I have a similar product here called Dritz Wash-Away Wonder Tape. It works exactly the same way, so if people can’t find the Prym, it might be worthwhile looking for Dritz. 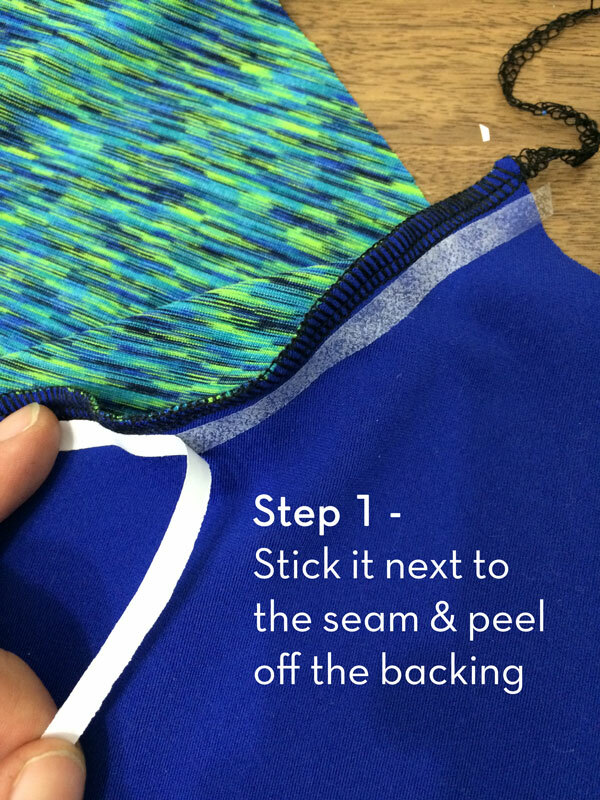 I use it a lot for putting pocket layers together rather than tacking, as there’s less bulk in the final seam. And zippers of course. I’ve used it for LOTS of zippers! Ah, that’s good to know it goes by another name over there, thanks! Dritz is actually a division of Prym, so it is probably an identical product. There’s another one, Collins wonder tape, which is a more gummy-like product. I’ve used it for zippers, lingerie sewing, etc. However, the Collins product seems to leave a residue sometimes, and I’m not sure that it is truly a wash-away product. I think I’ll try the Prym/Dritz tape next. Thanks for the tips. ah interesting! I didn’t know Dritz and Prym were related! Such a great surprise to see your article in Threads last week! Great work. Hi Melissa, do you have any top tips for repairing a hole in the knee of running trousers? Hi, there’s not really enough information to advise – is it in a seam, or the middle of fabric? How big is the hole? Cab you patch it with the same or contrasting fabric (definitely do the opposite knee as well so it looks intentional). 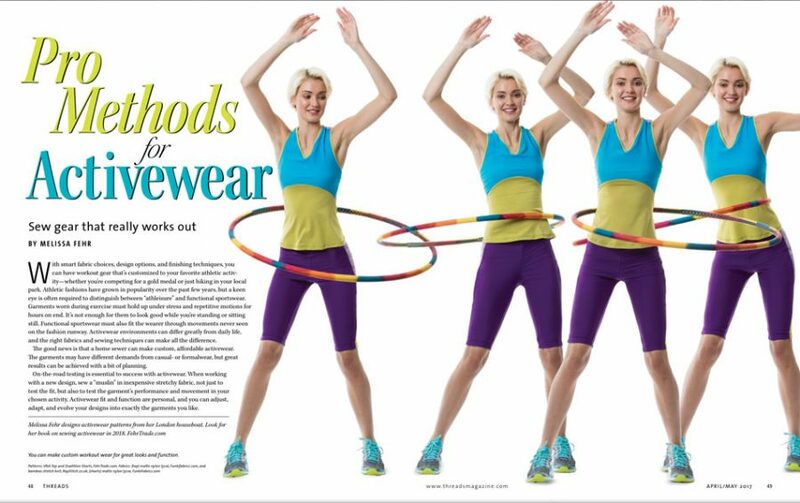 Or just cut them off into shorts instead? Lots of different options! Hi, I have a huge roll of double sided sewing tape that I got from Sailrite. The glue gums up my needle and it is a constant battle to keep cleaning. Does the Prym or Dritz create the same issue? Ugh how annoying!! I’m not familiar with the Sailrite brand but I’ve never had any gumming issues from the Prym tape. Great to hear…thank you! I will definitely give Prym a try.